Chvrches have released their first ever duet, a collaboration with The National’s Matt Berninger. ‘My Enemy’, the second single to be taken from their upcoming third album Love Is Dead, is a more subdued affair than the spunky ‘Get Out‘ that debuted a few weeks ago, the band opting for a more melancholy sound on what could cautiously be described as a ballad. 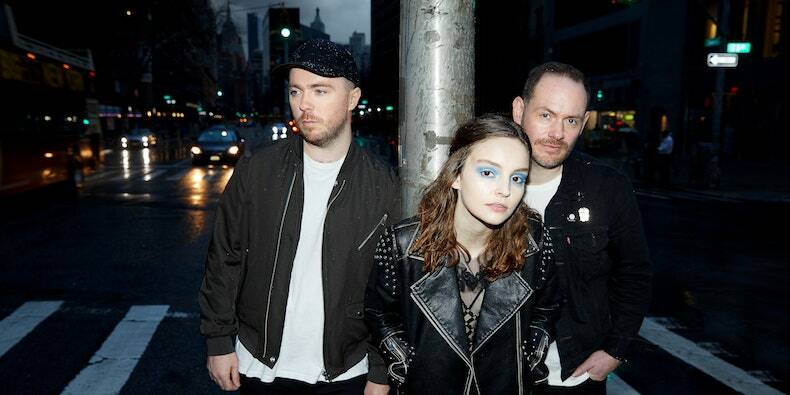 But while ‘My Enemy’ is a slower track than the uptempo synth-pop the group are known for, it still comes with all the characteristics of a typical Chvrches track. Berninger starts things off with a doleful verse, singing over a gentle ebb of synths before Lauren Mayberry intervenes with her cut-glass vocals, sounding like a celestial space-queen descending from on high. As a duet, despite the disparity between Berninger’s earthy hum and Mayberry’s crystal clear trill, it works. In fact, perhaps it’s precisely this juxtaposition that makes it work. When the pair sing in harmony, Mayberry is shadowed by Berninger’s vocals, his voice serving almost as a buffer between her and the icy clash of synths. In the past, Chvrches have sounded almost entirely electronic, Mayberry’s voice like a synth in itself, but here Berninger adds a touch of something more human. Though at times he sounds a little at odds with the arrangement (he recorded his vocals at home rather than with the group), he gels with the track’s wistful mood, echoing Mayberry’s pensive tone. ‘My Enemy’ is both a rebuke and an olive branch, shifting from throwing insults (“Your jealousy is more blind than love”) to offering reconciliation (“You could be my remedy / If you could show me love”). Rather than playing the roles of warring lovers though, Berninger and Mayberry seem to sing from the same perspective, albeit one that contains an internal struggle. While Berninger focuses on the destruction of the relationship, resigned to the fact it’s dead, Mayberry offers something more hopeful, the slightest suggestion that it may be resurrected. Only on the condition, as she pointedly tells her ex, that she can “stop remembering all the time that you used up”. A departure from giddy synth-pop, ‘My Enemy’ makes for a solid duet, an unlikely meeting of minds that suggests a more thoughtful approach for the band’s upcoming album. Mayberry recently told Pitchfork she wanted to be “more honest” in her writing, and it’s possible ‘My Enemy’, an uncharacteristically literal track, is the result of the band’s efforts to move away from metaphor and into something more tangible. But whatever the group’s intention, they’ve pulled off an affecting synth-ballad with ‘My Enemy’, showing a rarely seen side to the group that, although different, is no less intriguing.